← Britain’s police is a sham when it comes to race: When will we admit this? Religion: Humanity's inspiration or destruction? During the Easter break it seems relevant to discuss how the world’s major religious leaders and followers have let down humanity with their support of war, imperialism and mass murder in the name of a divinity which supposedly holds life as the most sacred thing on earth. Religious leaders have always promoted their faith by saying that religious values has shaped the modern world and in particularly law and order. It has been argued that civilisation owes its values, its system of justice and morality to religion. Yet the world’s major religions have been responsible for some of the worse massacres and crimes against humanity in human history. The slave trade, the persecution and irrational slaughter of women during the witchcraft trials, the European empires which justified their plunder and pillage in the name of the God that they claimed to represent. Yet all religions have one common theme, the sanctity and sacredness of life but in today’s world of conflicts and wars for greed, resources and power, the leaders of the world’s major religions remain silent on the atrocities committed in contrary to the laws that they themselves claim forged modern civilisation. The leader of the Catholic religion, the Pope gives an annual message to his followers and the world each Easter, and each time the message is arguably empty and lacks substance. His messsage is always the same and repetitive, calling for peace around the world without actually denouncing the warmongers and enemies of peace. The leaders of the world’s other religions are similar in their silence on the atrocities committed by world leaders and their militaries in the name of religion. Imagine a member of the public slaughtering entire families and saying that God told him to do it to bring about a new age; all I can safely conclude is that the individual would be cautioned under the Mental Health Act. Yet the context of this article is not to question the sanity of religious people, but their morality and commitment to their faith. American oil corporations gained huge oil fields from their war with Iraq, as well as control over other precious resources, I wonder if that was Bush’s God’s plan? Whatever you may think of religion and religious people the main commandments are clear and killing is a divine crime, and stealing and greed are crimes also. That Western leaders can use the name of God to justify their imperialist wars in Africa and the Middle East speaks volumes about the type of Christians which reside in the West, they clearly do not read the same religious books which denounces the very acts these leaders commit. I like this quote because it sums up what is wrong with religious people, and it is not the religion that they profess but rather the way they distort their beliefs to suit their particular prejudices. I read an interesting article on the Inter Press News website, by Ashfaq Yusufzai, To Hell With Suicide Bombers, Not Heaven (April 5, 2012) where religious scholars in Pakistan are denouncing suicide bombers, saying that their acts are not approved by Allah, or justified in the Koran. They say that suicide bombers and those who pervert young minds to become suicide bombers are destined for hell and not heaven as they believe; because taking innocent lives is breaking the most sacred law of the Koran. It would be nice if Christian religious leaders and teachers in the Western world could follow suit and denounce Western leaders who use the name of God to justify wars of imperialism, greed and plunder. It would be nice to see the Israeli government and military practice what their religion teaches which is the sanctity of human life. It would be nice if the government of Pakistan and India would follow their sacred laws which forbids the killing of a human being. Imagine, if in the Pope’s Easter address or the Archbishop of Canterbury’s message, they denounced Western leaders for their mass murders, theft and plunder? Unfortunately this is just a Utopian fantasy and it is unlikely to materialise because as Washington’s Blog suggests, many religious people believe in the end times and disturbingly, many are aiding the slaughter and accelerating the world towards a nuclear Apocalypse with joy because in their mind it will bring in a new age. Whatever one believes, the world’s religions all teach that life is sacred and killing is wrong, but when followers of these religions justify murder and theft and greed and war, then arguably it is not a new age that this world will enter but a barbaric age which will end humanity. Some would argue that religion has let down humanity, but I would argue that it is religious people who have let down humanity because they are so unlike the teachings professed in their books. This entry was posted in Religion and tagged U.S. President George Bush claimed that he heard God telling him to attack Iraq, the world's major religions have been responsible for some of the worse massacres and crimes against humanity in human history. Bookmark the permalink. I agree with the conclusion of the author that it is religious people who have let down humanity because they are so unlike the teachings they profess. In my opinion Bush and Blair are not real Christians, they were fake Christians. As the author of above article points out, there is no way you can sincerely believe in God whilst waging illegal wars on innocent people. The media will try and make the bad guys look good. I have also come to the conclusion that the religions Christianity, Judaism and Hindism actually promote racism. Did you know that when South Africa was under Apartheid rule, it was also considered the most Christian country in the world? Judaism also promotes racism which we can see in the behaviour of Israel towards non-white Arabs. In my opinion, Islam is the best religion in fighting racism. I certainly agree with your view that the behaviour of Bush and Blair is certainly unlike the teachings of Jesus. 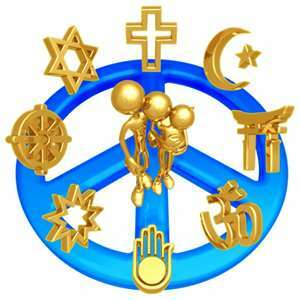 I think your view is debatable however, regarding the teachings of Hinduism, Judaism and Christianity promoting racism. My article addressed religious people from all religions as letting down humanity. I made specific emphasis on religious people often not following the very teachings they profess. If Hindus, Jews, Christians and Muslims etc., were following the teachings of their faith, then it could be questioned why so many wars and conflicts and senseless killings are carried out in the name of these religions. I mentioned in my article that religious people distort their beliefs to fit in with their prejudices, but the basic teachings of every religion from my understanding is respect for life and respect for your fellow human beings. Those who practise racism, bigotry, slavery and any other form of oppressive human trait are clearly not abiding by the tenents of their faith in my view. People professing to be Christians, Jews, and Muslims etc., have oppressed and persecuted other human beings throughout history in one form or another through slavery, and wars of conquest as the historical records show. So in my view it is not a question of which particular religious group has practised more racism, but rather when will religious people abide by the moral laws recorded in their books?